Every morning last week, I would look out the front window as I ate my cereal and see this. 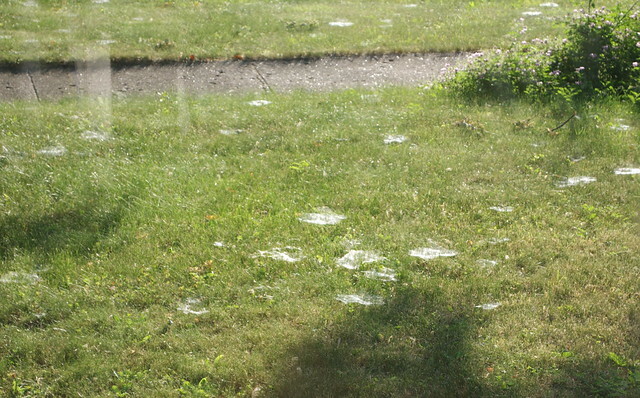 The webs were all over the front lawn. I don't know if spiders are territorial, but some of those are really close together. You'd think they would get into arguments over whose bug that is. I also marvel that there are enough bugs to keep the spiders happy. Zeke mowed the lawn on Friday before he left for vacation. There are no more webs to be seen. I'm kind of sad because it was quite the novelty, but the grass needed a mowing. With our lack of rain, I figure the spiders will be back in a couple of weeks.